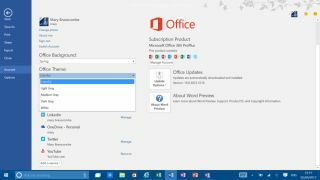 After announcing that Office 2016 will become available for consumers starting September 22 and for business users starting October 1, Microsoft reveals that it is adopting the same update strategy that it is taking for Windows 10. When the Microsoft switched to offering Windows as a service, rather than as a software product, it revealed that updates will automatically download and install in the background, and consumer users cannot opt out of these updates, bringing security patches, fixes or new features to the OS. With Office 2016, enterprise customers will be placed in similar Current Branch or Current Branch for Business, following a similar upgrade cadence as Windows 10. Unlike Windows, however, there will not be a third Long Term Service Branch, or LTSB. Users on Current Branch will receive new updates and features faster. They trade off a little bit of stability as the new features may not have undergone large scale testing, but they also have access to new features sooner. Current Branch customers will receive updates on a monthly cycle. On the other hand, Current Branch for Business, or CBB customers, will get updates every four months. Microsoft will still deliver security fixes as needed in the months where there isn't a CBB update. Like Windows, customers must stay current to receive future product updates, security fixes and new features. In a similar strategy to Windows 10, Microsoft is forcing CB and CBB customers to install updates as they're ready, but CBB can delay updates if needed. Unfortunately, this means that like Windows 10, CB customers cannot skip an update. CBB users can defer one cycle of updates, which gives them four months to decide. If CBB customers defer updates, they must deploy the subsequent round of updates or else they would not receive further updates from Microsoft. Your placement in CB or CBB will vary depending on the Office 365 package your organization subscribes to. Office 365 Business and Office 365 Business Professional users fall under the CB track, while Office 365 ProPlus, Office 365 Enterprise E3 or Office 365 Enterprise E4 users can switch to CBB for greater flexibility on when to deploy updates. The CBB plans are pricier, costing about $12 to $22 (£7-14, AU$16-31) per seat monthly, while the CB plans cost $8.25 to $12.50 (£5-8, AU$11-17) per seat monthly. The CB and CBB policies only apply to customers who sign up for the Office 365 subscriptions. Individuals and organizations who prefer to purchase a perpetual license won't be able to join the CB or CBB track, Microsoft said. Once Office 2016 is released, users of Office 2013 will continue to receive updates and security fixes for 12 months, and Microsoft is urging those users to migrate to Office 2016. Office 2016 will be available on September 22 for CB users, and the first CBB update will occur in February 2016. Business customers can start downloading Office 2016 in October through Software Assurance. There is also a separate version of Office 2016 for Mac.